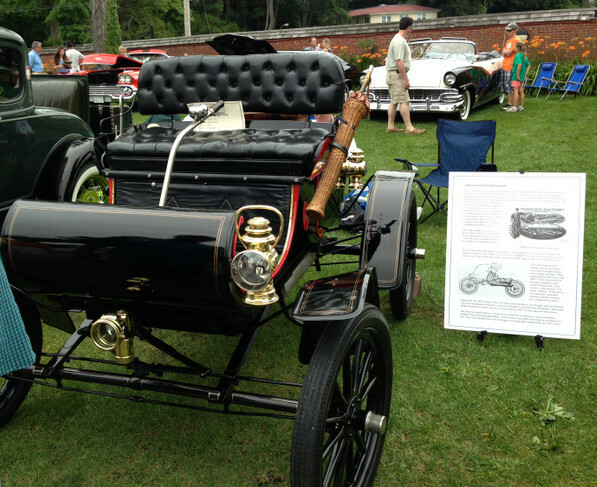 On Sunday I attended the North Shore Concours d’Elegance, which is held every summer in my hometown. The event is situated on a beautiful oceanfront estate, which serves as an elegant backdrop for the amazing cars that are on display each year. This year the event was going to feature a Microcar class. I put out the word among people in the area with little cars, but I was the only one to sign up in the category. While I often joke that my car is in a class by itself, they couldn’t really hold a competition with just one car. As it turns out a few other microcars did attend and we probably could have had a class. I guess there’s always next year. There was a lot of pre-event publicity. There were even a few articles in Autoweek magazine’s blog that mentioned my car! A BMW 600 parked next to my Heinkel . We had a lot of visitors! A close up of my friend Dan's 600. Technically it's not an "Isetta"
The Eldorado and the Lincoln were direct competitors and bookend a 1972 Cadillac Coupe d’Ville. The Lincoln has a 460 cubic inch V8, that Cadillacs had a 472 cubic inch V8. The Heinkel, by comparison, has 12 cubic inches. Maybe that’s why those other cars get about 8mpg. A “love it or hate it” color scheme on the this freshly restored award winner. I like the colors. You can understand why horses were scared when they heard these cars. Very loud and interesting noises from a 100+ year old car! The Cord was the first car with hideaway headlights. The car also had front wheel drive. For more official coverage, you can visit the Concours website at http://endicott.edu/concours.aspx.